Collaborating with colleagues and students is almost effortless since I started using Google Apps with my students, primarily Google Drive. Recently, our campus adopted Google Apps for Education, which gave us the option of merging our existing campus email with Gmail. I thought that alone was pretty harmless and uneventful, until I started exploring the possibilities. Now my ability, and that of the teacher candidates with whom I work, to collaborate on documents, gather information, and archive information has increased and the process is much more streamlined. When I first learned of Google Drive a few years ago, I knew only of Google Docs. Our campus email was not integrated with Google at the time so I had two separate email accounts – my campus email and my Gmail. I used my personal Gmail account and utilized Google Docs as a way to archive important documents (like drafts of my dissertation). I attempted multiple times to use Google Docs in my teaching by writing out discussion questions for students to answer in small groups during class. I was able to do this by creating a Google Doc, then share it though the link provided when I added other viewers who could edit. I then either emailed the link to my class, or added it to my class website. The goal was to be able to have all my students work on different questions then have the ability to project the whole document to the class for our whole group discussion. It was meant to replace using chart paper and markers that were a staple of our group discussion and sharing. The students would then have notes from each of the other small groups who worked on different questions, and all these notes were saved on my course website for the remainder of class. Without fail, I had students who could not access the document for one reason or another. Some had difficulty if they did not have a Gmail account. Others simply could not see the text on their own laptops. In the not so recent past, asking my students, all pre-service teachers, to collaborate on a document meant sitting down together hunched over the same computer screen with one typing. This style of collaborating had benefits, because they were able to share ideas and instantly put them in words. The downside was finding a time for both of them to work together to devote to this task. If they could not meet in person, the task meant working independently at their own computers then merging text together once they shared their writing through email or with a flash drive. This was effective because each could each compose on their own time and share when done. The downside to this method was limited face to face collaboration and the writing was frequently disjointed because they usually divided the task into parts. This type of collaboration also made it difficult to keep track of the most current version of the document, especially if multiple revisions were emailed back and forth. Now that all my students’ campus emails are linked with Gmail, they all have Google accounts so they have many more options for collaborating. They meet face-to-face during class time, but work on group assignments using Google Docs. When working on a lesson plan together, my student teachers have reported sitting at their own computers at home while writing up a shared lesson plan. They use the chat feature to discuss what ideas are included. The collaboration is in real time and both student teachers have the most recent version of their document. 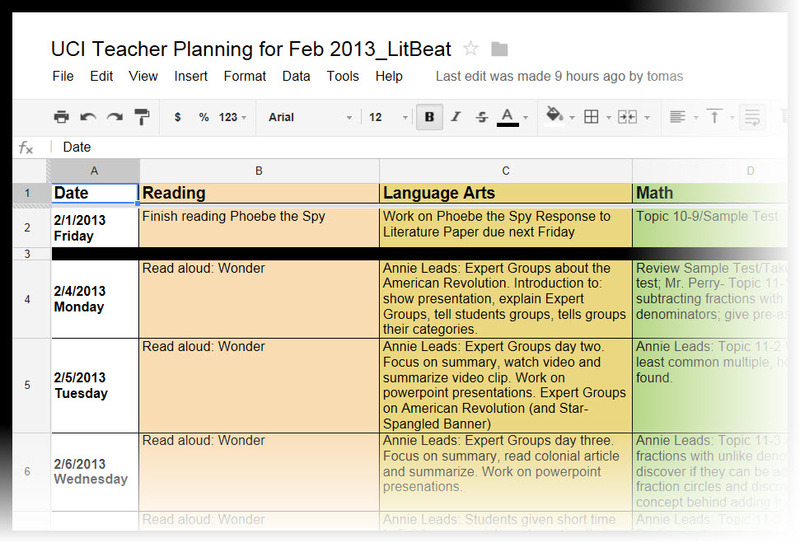 Pairs of student teachers used Google Docs for their weekly lesson plans, as well. They maintained a shared document with the mentor teacher so everyone was aware of the week’s plans and any changes made. The mentor teacher shared these plans with me so I was also able to monitor my pre-service teachers’ weekly progress. Each lesson evolved, collaboratively, over time and in the cloud. See figure one, below, for an example of the final product. 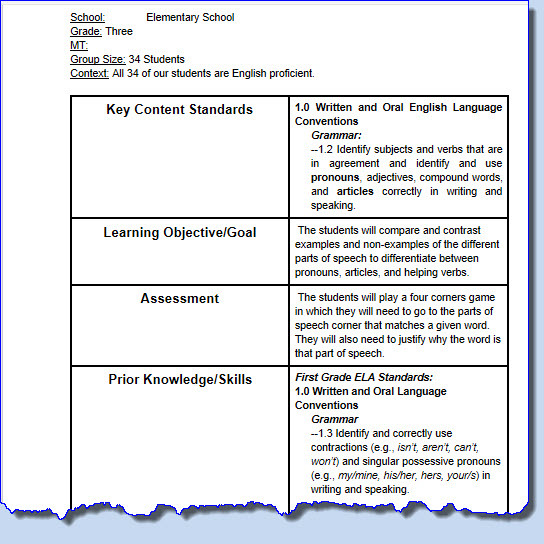 The unit plan (figure 2, below) was created by a mentor teacher, Johnnie Perry, when he had two student teachers in his classroom. They used the Google doc to keep updated versions of their weekly plans available to all three of them. I also teach a class in the masters of art in teaching (MAT) program where my students are required work in a small group to write an action research proposal. The majority of my students wrote their group papers using Google Docs. Even though they met face-to-face twice a week in class, group members had to open their own computers as they discussed the themes of their literature review or selected instruments for data collection. During this conversation, one or more members of the group put these ideas in writing during this collaboration. As an instructor, it was gratifying to hear these rich conversations and see their projects develop as multiple colored dots, representing each author’s cursor, floated across the screen. This type of collaboration ensured all students in the group had the same version, even if one member was away that day. These students also mentioned using Google Hangouts to discuss their writing when they composed from home. I’m positive that we have just scratched the surface on how using a cloud-based shared document, like Google Docs, can aid collaboration and writing, especially for student and novice teachers. The potential for teachers to share ideas and put them down on “e-paper” is unlimited – even at brick-and-mortar institutions like mine, where most of the classes are “on-the-ground.” How do you facilitate collaboration for your student teachers and teachers in training?